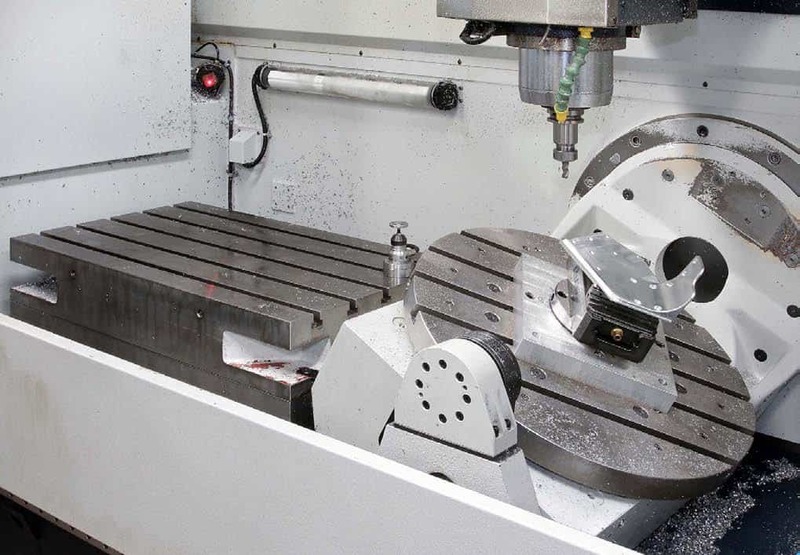 A familiar refrain among contract machinists is that they do not know what type of job will come in next, so machine tools on the shop floor need to be as flexible as possible to tackle a wide range of component types and sizes. One machining centre that offers a particularly high level of versatility is the Spinner U-1520, as recent customer Loftlock Precision Engineering explains. The aerospace subcontractor, which is celebrating its 40th anniversary this year (2014), brought the German-built machine in February through sole UK agent, Whitehouse Machine Tools. Loftlock ’ s managing director, Kevin Douglas and his son, Steve, were convinced that the vertical-spindle, 5-axis machine was right for their company as soon as they saw the specification. No particular jobs were lined up for it, but it was soon working flat out producing parts in mainly aluminium but also in titanium, stainless steel, phosphor bronze and aluminium bronze. Other materials are also machined occasionally, such as tungsten alloy to make ballast weights for Formula One race cars. 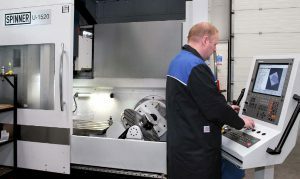 More than three-quarters of turnover at the Reading factory derives from prismatic machining, with the remainder from fixed-headstock CNC turning. The key to the Spinner machine’s adaptability to suit many different types of job is its dual table design. A 2-axis CNC arrangement comprising a -90 / +110 degree swivelling trunnion carrying a 650 mm diameter rotary table is positioned at the right hand end of the machining area. A fixed table sits alongside it to the left. Complex 5-axis work may be undertaken on the first table and 3-axis machining is available on the second table in the same cycle if another part is fixtured on it. In this way, one complete component requiring two operations emerges from the machine every time the operator opens the door. Alternatively, with the rotary table positioned horizontally so that it is coplanar with the fixed table to form an extended X-axis, a component over 1.5 metres in length can be machined in three axes. Kevin Douglas enthuses, “Such versatility makes the Spinner U-1520 an ideal subcontractor’s machine. He describes how the machine was deployed virtually as soon as it arrived on the shop floor. The first job was a batch of L168 aluminium alloy turntable bases for a helicopter seat, which required 3+2-axis machining in the 5-axis area of the machine. Almost immediately that finished, an order came in for a large run of aluminium rocket sleds that measured almost the full 1.52-metre X-axis dimension. Good access to the working area including from an opening side door facilitated loading and unloading the components. This simpler, 3-axis job ran for a month before another 5-axis job was put onto the Spinner. Mr Douglas continues, “We had run this job several times before, but we only had machines with one-metre in X so needed to reposition the parts two or three times to complete the cycle. The helicopter seat turntable had also been manufactured previously by the Reading firm on another make of 5-axis vertical machining centre, which was the first on site and was delivered shortly after MACH 2012. However, the machine was operating at the limit of its capacity, whereas the Spinner offers a generous 5-axis envelope of 620 x 520 x 460 mm. 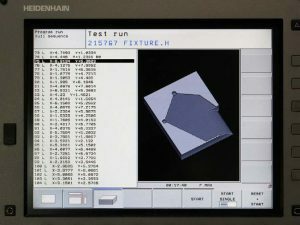 Simple programs are entered into the U5-1520’s TNC630 control on the shop floor using Heidenhain’s conversational GUI (graphical user interface). More complex 3-axis cycles, with and without positioning and hydraulic clamping of the rotary axes, are created in SmartCAM. The Spinner machine is also capable of fully interpolative 5-axis machining, programs for which are written by an external specialist, for now at least. There are other aspects of Loftlock’s 40-taper, 12,000 rpm-spindle machine that add to its suitability for the subcontracting environment. One is the optional 54-station tool magazine for holding a wide range of cutters, sufficient to complete a spread of different jobs without having to insert new tools. A Heidenhain TT140 table-mounted touch trigger probe enables tool measurement, wear monitoring and breakage detection. Another benefit of the U5-1520 is the provision of through-spindle coolant delivery at 22 bar which improves chip breaking, especially useful when drilling and machining stainless steel, and promotes efficient removal of swarf from the working area. Mr Douglas added that after-sales service has been good. He was unfortunate to have to test it early on, as accidentally dropping a heavy component meant that the swarf conveyor had to be replaced. The part was flown over from Spinner’s Munich factory within 24 hours and was fitted on the same day by Whitehouse Machine Tools.